I was without a blog for several days while I struggled to set up my custom domain...UGH!!! Thanks for sticking with me, because now I'm back!!! 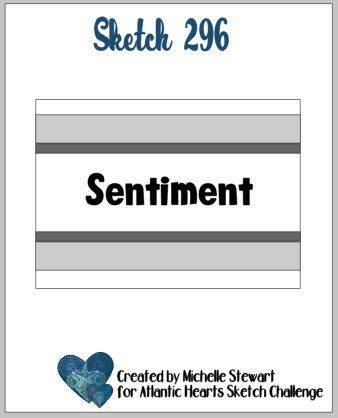 And I'm here to show you the latest sketch we have this week at Atlantic Hearts Sketch Challenge. Believe me when I say, you will make something in no time following this sketch. Perfect for this busy week of traveling, family and fun!! And here's my card, using several new products from Stampin' Up that will be available January 3rd. That's when the new Occasions catalog will go live AND when Saleabration begins!!! What is Saleabration you ask? Why it's a period of time when you can receive exclusive product FREE with a $50 or $100 order!! And what wonderful products you get to pick from! On my card, the Salebration items include the Botanical Butterfly DSP (I've already started hoarding this paper...it's BEAUTIFUL!!) and the Butterfly Elements. The stamp set, Life is Grand, is from the Occasions catalog. 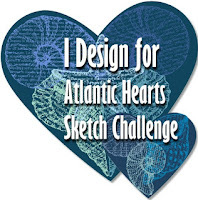 Be sure and join us at Atlantic Hearts Sketch Challenge, we love seeing what you create! !